Summary (from the inside flap of the book): Anna Fox lives alone--a recluse in her New York City home, unable to venture outside. She spends her days drinking wine (maybe too much), watching old movies, recalling happier times...and spying on her neighbors. Then the Russells move into the house across the way; a father, a mother, their teenage son. The perfect family. But when Anna, gazing out her window one night, seems something she shouldn't, her world begins to crumble--and its shocking secrets are laid bare. 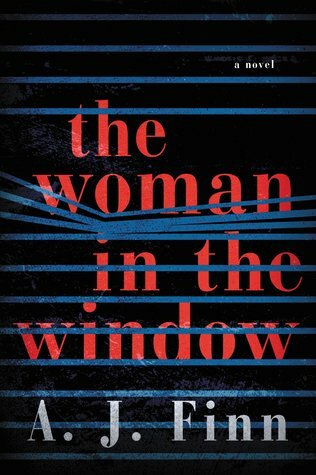 Review: The description of this book immediately made me think of the movie Rear Window, which I really liked, but I was afraid it wouldn't be original. That fear was unfounded. The first half of the book sets the stage for the "event" as we get to know Anna and her world. She is agoraphobic and has been inside her house for almost a year, spying on her neighbors is her way to connect with the outside world. But connecting to the outside is only an illusion. She plays chess online, orders groceries online, and, as a psychotherapist, she counsels other agoraphobes online. There's far too much wine drinking going on as well. By the time Jane Russell actually comes into Anna's house, I felt like I knew Anna well and was excited for her to have a friend come inside and spend time with her. But meeting the Russell family brings a whole new level of confusion, panic, and activity that kept me on the edge of my seat reading the second half of this story. I can't say much more because I don't want to give away all the tension and excitement of this excellent thriller!